Our house is located at a place called 'Lassalle', 400 m from the pretty village of Gimbrède. We live on the spot, in another part of the property and are at your disposal, if you wish. Your house is completely independent. Of course you can use the pool at your leisure, we provide maintenance and cleaning. The arbor offers a beneficial shade at noon and will also be very pleasant in the evening at sunset and even after. Gimbrède is located in the hilly region of the Lomagne Gers, away from any city or industry. We are calm. Agen, the nearest town, is just over 20 km away by car. But you will find all the amenities in the nearby village of Astaffort. Our region lends itself to a life without stress. It is conducive to rest, reading, idleness ... It allows to recharge and recharge its batteries ... It is also a gourmet region and live well. Finding it was a bit tricky some more detailed driving directions would have been useful rather than the very basic google map in the end we had to call owner who came and met us in the centre of the village and we followed them to the property. Personally I think you'd struggle to house more than 4-6 people as there is only one shower room, comfortable seating was a sofa and single chair so no more than 4 people could sit in the lounge but a lovely big dinning table with 8 chairs. The 2 bedrooms upstairs had double beds but theses were extremely low even with the mattress you would be not more than a 1.5 foot off the floor something to bear in mind if any of you party are elderly and all the bulbs in the bedside lights needed replacing. Outside space was brilliant although no lighting they didn't appear to be working so it was dinner by candle light if you wanted to be outside, or by the light off your mobile phone to get the house open if you came back late at night. However the pool was great and this is where we spent the majority of our time. Despite being on the property we rarely saw the owners and certainly didn't uncomfortable and I was very grateful for their assistance when I had a flat battery they very kindly helped me push my car to start it. I inform you that following your remark we added a 2-seater sofa. We try to assure you of our best attention at all times. We stayed with René and Sylvie for a week in April. A truly magnificent experience. Superb accommodation, wonderful location and surrounds. Outside area (covered or open) for dining al fresco/BBQ. Pool is available should you feel the need. The house is well located for the local markets and is a fabulous base from which to explore the area which is spectacular. René and Sylvie made us feel like part of the family with genuine warmth and French hospitality! I would recommend this property without hesitation! 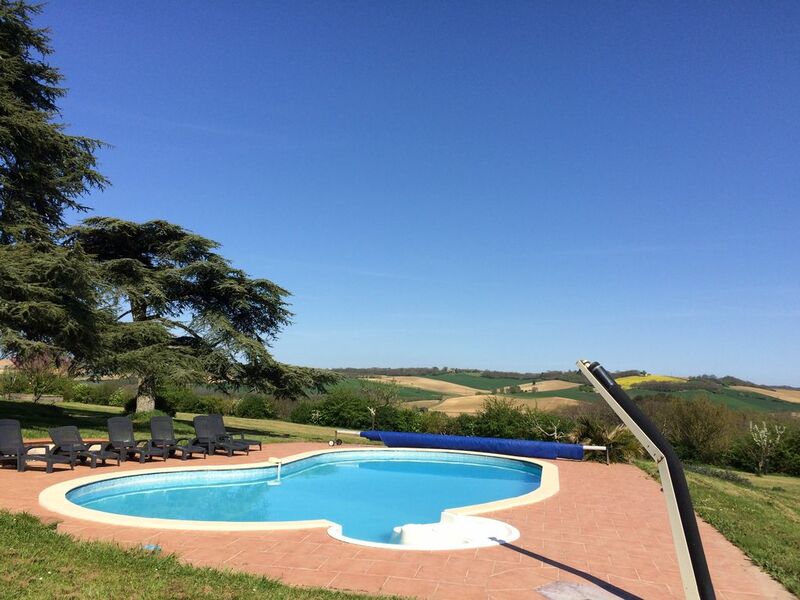 Un lieu parfait pour se reposer au calme sans bruit au bord de la piscine ou sous la tonnelle avec une splendide vue loin des grandes villes. La maison est très jolie et très bien équipée y compris pour un bébé Monsieur Bürckel se fera un plaisir de vous monter le lit ou la chaise haute... Les Propriétaires sont là pour vous renseigner ou pour apporter ce qui pourrait manquer et vous aurez peut être la chance de passer un moment agréable avec eux. Nous avons passé un superbe séjour en famille à Gimbrède. La maison qui a fait l’objet d’une très belle rénovation est très accueillante et parfaitement équipée. Rien ne manque. De plus le linge de maison est fourni. Un réel confort ! Le cadre est exceptionnel (vue imprenable sur la campagne) et la piscine parfaite. René et Sylvie sont des hôtes à la fois extrêmement accueillants et très discrets. En résumé un endroit parfait pour se ressourcer. Nous reviendrons très certainement. Vacances reposantes, calme et détente assurées! Nous avons passé 1 semaine fantastique avec nos 4 enfants . Maison fonctionnelle, très propre, nous n avons manqué de rien. René et sa femme sont aux petits soins, la piscine , le terrain et le point de vue sont exceptionnels. Nous reviendrons assurément . anne k et fred l.